The Excelon HBK-410 Smart Blocker features smart digital scanning technology as well as improved performance and increased stability. Easily load a finishing block into the holder and use the new smart arm to flip the attached block 180 degrees and adhere to the lens with a leap pad. Built-in smart digital scan technology recognizes unique and traditional frame shapes and drill holes. 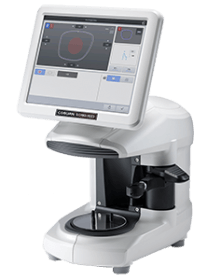 High resolution and sharp imaging capabilities allow for easy viewing of laser markings.